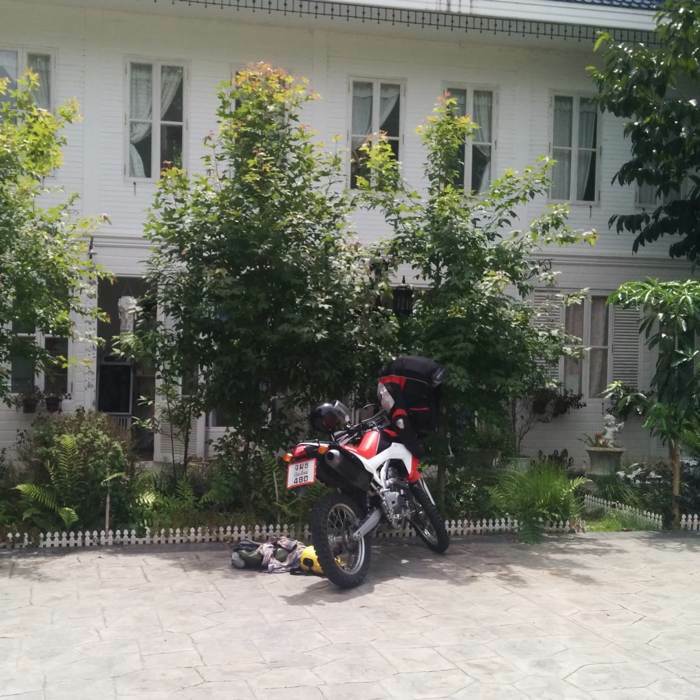 If you are planning on visiting Thailand then chances are you will drive a motorbike at some point. However many people come to the North of Thailand to do the world famous Mae Hong Son loop – a three to five day ride which starts and ends in Chiang Mai city and goes around the whole Northern Mae Hong Son province (hence the name). If you and your friends are confident riding a motorcycle then this is a fun road trip to do as a group. If you are planning on fitting two people on a motorbike then plan ahead with a good backpack (or even a tank bag which you can’t buy in Thailand) otherwise you might find two people a tight squeeze on a small scooter! Starting from Chiang Mai most people go south clockwise around the Mae Hong Son loop. Your first stop could be Doi Inthanon, the highest mountain in Thailand! It is about 2 hours from Chiang Mai and the windy mountain road will take you up through a pretty national park and all the way up to the 2565 metre high peak. Don’t forget to bring some gloves and a scarf (or a kerchief) because at all times of the year it is pleasantly cold compared to the rest of Thailand. A camera capable of zoom would be good to as Doi Inthanon is also home to lots of rare birds. Consider having lunch up there before heading back down as the next stop is a good 5 hours away with very few good places to stop. Hopefully you make it to Mae Sariang before sunset so you can have a beer by the river. If not then put on your sunglasses (and keep your mouth closed) to avoid the bugs that love to fly into your headlight at dusk. Day 2 and you will be driving from Mae Sariang to Mae Hong Son, which takes about six hours. Take your time as the road is windy but beautiful and if you feel your eyes wandering to the dense jungle or cleared hills of farmland then stop to take a rest and a photo. The local people will be dressed in traditional clothing so if you are lucky enough to see them along the road you won’t even need to visit the Karen hilltribes. However the villages are interesting to see so after the small town of Khun Yuam consider stopping off at one of the signposted ones. Visiting these villages are a chance to step back in time! You are as much the attraction as they are to you and most likely they will dress you up in traditional clothes. Eventually say your goodbyes and buy some traditional gifts for friends back home then finish the day at the Mae Hong Son temple watching sunset over the Burmese border mountains. It’s a good idea to use Mae Hong Son as your base for Day 3 as this will allow you to explore the off the beaten track part of Thailand. Have breakfast overlooking the little lake in Mae Hong Son and planning your trips to hiking spots, waterfalls, more hilltribe villages and the Chinese town of Ban Rak Thai – you will feel like you left Thailand for China! Again head back for sunset (the roads are scary to drive at night) and order some freshly grilled fish at one of the lakeside restaurants as a reward for your adventures. Day 4 will take you to Pai, a small hippie town nestled in the mountains and the perfect place to relax after driving. How long you stay here is up to you, but pack your days with good food, massages, smoothies by the river and a few whiskeys at the reggie bars. Pai is known as a travellers paradise! From Pai, Chiang Mai is only three hours away and whilst the road seems simple it has big potholes so drive slow and take breaks in the cute coffee shops dotted along the road. Arriving back in Chiang Mai will mark your journey complete and you will have some great memories, pictures and souvenirs from one of the most beautiful provinces in Thailand! Packing one mid sized bag with a few days change of clothes will be enough but here are a few handy essentials that will make the journey easier: rain jacket or rain poncho (essential in the rainy season), waterproof bag, headlamp or torch, antibacterial wipes, antiseptic, mosquito repellent, sunscreen (face and body), portable charger for batteries (small, medium and large), jumper or scarf for the chilly evenings, travel towel, water bottle, GT rider Mae Hong Son loop map!